When I got home from ACR, there was a medical bill waiting to greet me at home (isn't there always?) This particular medical bill contained not one but two $10,455.50 charges - one for each of my most recent Rituxan infusions. The total charges listed on the bill added up to $21,797.96. And if that's not enough to make you feel a little bit nauseous, I don't know what is. "Luckily," since we have already met our extremely high deductible for the year, we were "only" being billed for $3,117.62. And while that number is significantly less than $20K, it is still an amount of money we absolutely do not have to spend. In fact, after my emergency root canal, repairing our car after a small accident, and buying three plane tickets for my sister's wedding in January, we currently have that amount of credit card debt already. 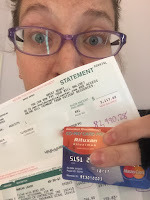 The good news is that the Rituxan Co-Pay Card Program is supposed to help me cover the cost of the medication itself, which by my calculations comes to $2,990.28. And I want to make it clear that I am extremely grateful for this financial help. Without it, Rituxan would not even be an option for me - and (knock on wood) I seem to be doing really well on it, for which I am also grateful! What I am not grateful for, however, is the extraordinary amount of hoops I have to jump through to get this help. The way the Co-Pay Card Program is supposed to work is that, when you get your bill, you fax your Explanation of Benefits (EOB) to the program, they load your card with the right amount of money, and you use the card to pay your bill. Unfortunately, it is never that simple. Six months ago, when I had my first Rituxan infusion, it quite literally took me several hours on the phone to figure out where to even fax the EOB in the first place. (If you are a Rituxan patient and need to fax your EOBs before you can use your co-pay card, let me save you several hours of your life: the number is 888-332-9864.) I figured this time around, since I already had the number, it wouldn't be as bad. So last week my husband used his work fax to send my EOB to the Rituxan Co-Pay Card Program. We got a response fax saying they had received it. I waited several days to make sure they had time to process my information. Yesterday I called, pressed the secret 0 key, and talked to a very nice representative in an attempt to find out the exact dollar amount that had been put on the card. (Because last time they put the wrong amount and I couldn't pay my bill until they fixed it). Shockingly, however, the Rituxan Co-Pay Card Program "did not receive" the fax my husband sent. They wanted to know if I could send it again. I'm honestly not sure why I'm still surprised when this stuff happens. I argued with them for a little bit, because I had a confirmation receipt saying that they had, in fact, received the fax. But ultimately I knew that if they couldn't find the information in my account I wasn't going to get the money I needed on my card. I knew I wasn't going to have any choice but to send my EOB it again. Because I was clearly frustrated with the situation, the very nice representative gave me another fax number, which she claimed was her direct fax line. She also gave me an address that I could snail mail the form to, in case fax was not convenient for me. (If you are a Rituxan patient interested in the address, it is: The Macaluso Group, 100 Passaic Suite #245, Fairfield, NJ 07004). My husband tried the "direct fax number" the representative had given me as soon as I hung up. Of course, there was no answer at that number and the fax could not go through. So we sighed and re-sent the fax to the original number, and then also put a copy in the mail. Now I guess I have to wait a few more days before calling them back again and trying all over again. I want to emphasize how grateful I am that this financial help even exists. 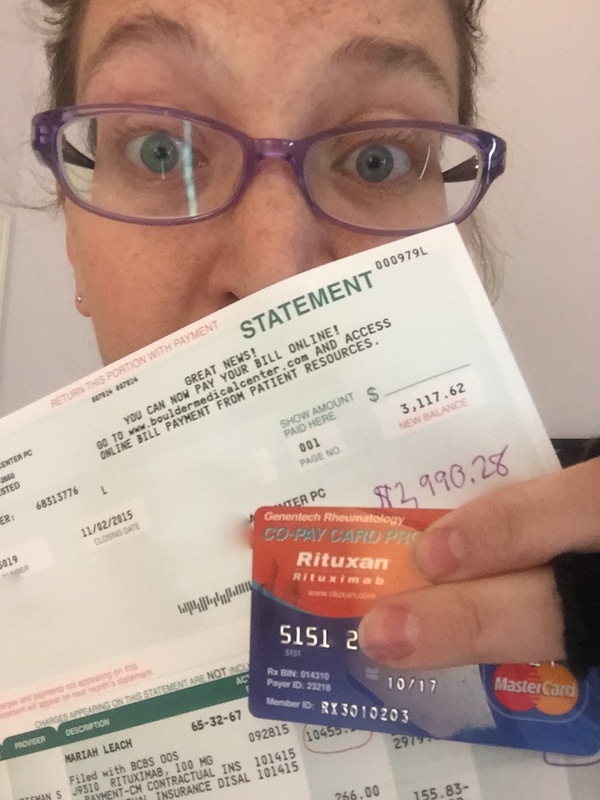 Rituxan has been working very well for me, and this life-changing medication would not be an option for me without this program. Butwhen you call the program the first thing the recording tells you is "we provide fast and convenient co-pay support to eligible patients" - which could not be farther from the truth. Every single time I have to deal with them, it takes several interactions, multiple hours of my precious childcare time and large amounts of my limited energy. The only positive thing I can come up with is that this medication only requires infusions every six months, so at least I only have to go through this chaos twice a year? I just can't seem to stop being surprised that "help" is so difficult for patients to come by.